It’s been said that Line of Fire is Hamilton’s best book. I can’t offer an opinion since I haven’t read it, but it’s certainly graced with one of the best vintage paperback covers ever by Raymond Pease, truly one of the unsung heroes of vintage art. So many good things about this cover : the wonderful sfumato shading; the general restraint, compared to the sledgehammer-like vintage paperback style of only a few years prior (with the more subtle look providing a clue as to the more low-keyed direction that cover art was headed in); the dreamy (or is it concerned?) 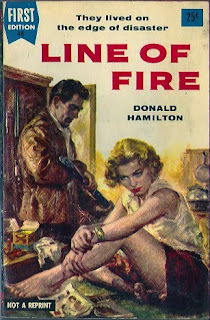 look on the girl’s face as she takes a break from magazine reading; the intense looking man inspecting the rifle in a businesslike fashion; nice but not overpowering lettering; that only about 2/3 of the cover is used for actual illustration; the way the off-white lampshade blends in with the nondescript light blob that’s the upper third of the cover. But what I like best is the ambiguous nature of the two characters, rendered as much by the artistic style itself as the demeanors of each. Overall, a masterpiece of subtlety and intensity by a much under-rated artist.